The information on this one is very sketchy, but it's a great image. 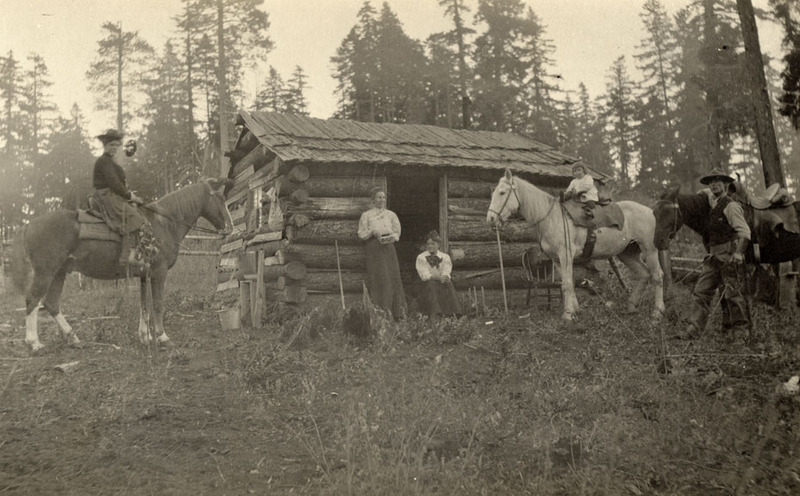 It is identified as Alvena Hoadley's cabin, and came from the family of Elda Bartmess. In 1982 it was suggested these are Bartmesses circa 1900, but there's not much solid evidence. Miss Hoadley was a schoolteacher in Hood River in 1904, and was married in 1908. In early 1904 she was also listed as a bookkeeper at Stewarts. The woman on horseback to the left looks similar to a portrait we have of Mrs. Bartmess, but the focus is not sharp enough to make a solid identification. A small advertisement: I'll be giving a lecture based on the Museum's photo collection tonight, March 19th, at 6:30 PM at Springhouse Cellars (by the train station). Doors open at 6:00. It's the final lecture in this year's "Sense of Place" lectures sponsored by the Columbia Gorge Earth Center. Great image. Give us a good close up of how those old cabins were constructed. Definitely cedar shakes on the roof. That horse the little girl is on must have been quite docile, but then Dad is standing fairly close. Also gives a good perspective about how tall the trees were in the Hood River area. Amazing that people lived under those conditions and still wore white, starched blouses. That is a rough cabin! Not sure I will make it your lecture tonight Arthur. I'm hoping to. Doubt if this cabin is being lived in permanently when picture was taken. Too much deep grass immediately outside the door and chinking between logs, particularly on the end of cabin, is in serious disrepair. Living a whole winter in such close quarters, oh my. Somebody singing or playing an instrument would be a life saver. Maybe they brought in their harnesses to work on while the wife did the mending? And what about doing the laundry?! Wash and hang it outside? Chapped skin. That's why we never see any obese or overweight people in these pictures. Survival was a very real issue that depended on the skill and determination and fortitude of everyone. You know Buzz, your comment got me to thinking.....could they be picking huckleberries? Can anyone tell what the lady is holding in the box? Lucy Alvena Hoadley married John Kilgore Dickey from Molalla, Wolf Creek, Oregon on May 23rd or 24th 1908 in Portland Oregon. John was the son of John K Dickey and Martha Ann Officer. Martha Ann was a member of the famed Meek cutoff party. I don't know if John K. was a member of the Hood River/White Salmon Dickey family. There is still a Dickey Prairie area outside of Molalla. This is a wonderful picture! Any idea of location? West side? East side? I wish I could be at the lecture tonight - I am sure it will be very interesting! Sadly mom, MaryAnn Scearce-Hanners, passed on 2-24-13, aged 89. I have been sorting her things. I found four postcards dated Feb 6,1925-26-27-28. Sent to her on her birthday, by her cradle roll teacher, signed Aunt Elda Bartmess & Mrs. Bartmess. Elda was not moms aunt. Hood River census' for 1920 & 1930 show, Elda C. was the wife of Samuel E. Bartmess. She was b.est 1857 in Indiana. This would have made her 67-71 when she was a teacher to mom. She died before 1930, as the 1930 census has her husband, Samuel as a widower. Son in-law, William L. Marshall, and daughter, Maria, with grandson, Ned Marshall are listed as living in his household in 1930.